A stay at Terminal Neige, Refuge du Montenvers nestled above the Mer de Glace glacier provides a high altitude mountain stay like no other. Highly recommended. 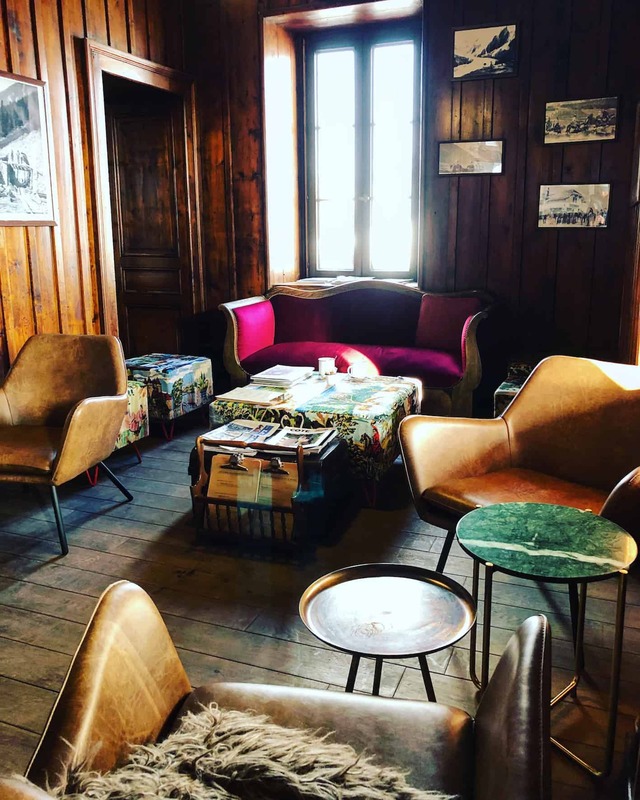 If you’re wondering where to stay in Chamonix in the French Alps, I implore you to book into Terminal Neige, Refuge du Montenvers. 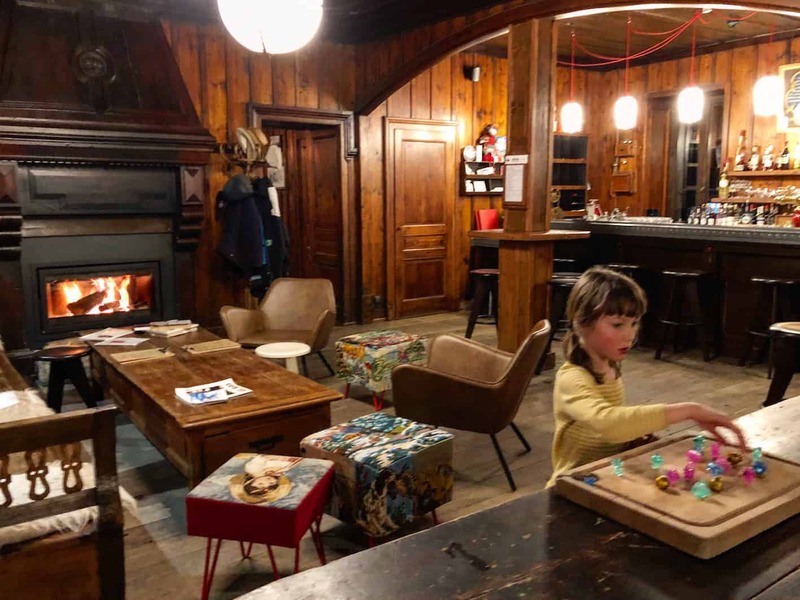 Recently renovated this legendary mountain refuge hotel, over 100 years old, offers a truly unforgettable stay for those seeking solitude, adventure and old fashioned charm in the heart of the Alps. 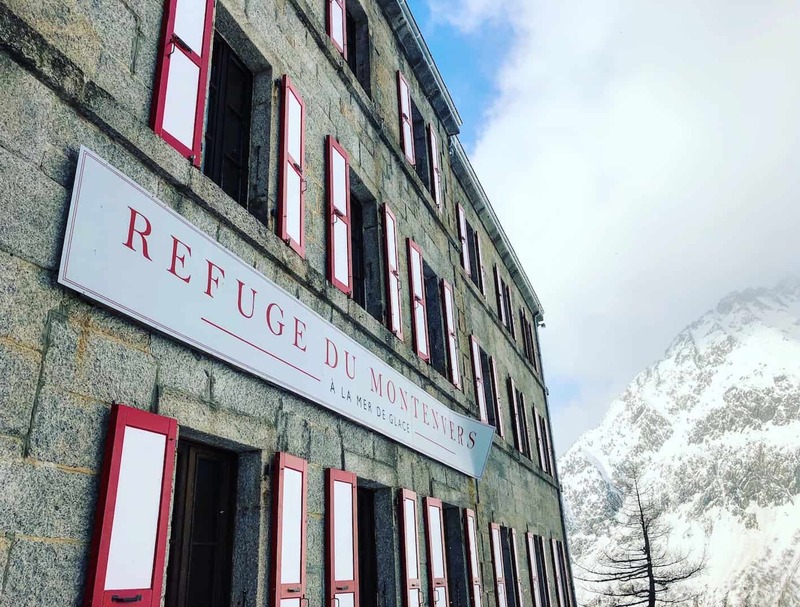 Perched above the Mer de Glace glacier, at an altitude of 1913 metres, Refuge du Montenvers offers guests the unique experience of staying isolated at high altitude in comfortable, stylish accommodation. 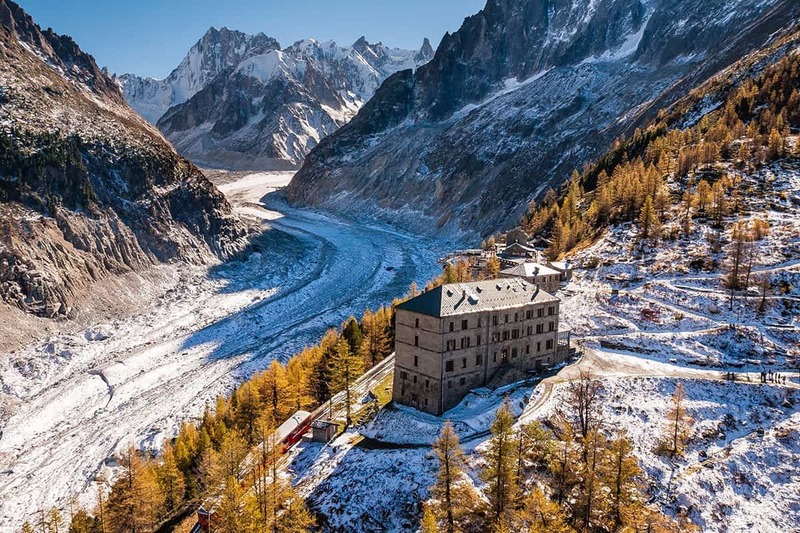 Built in 1880 to accommodate the first mountaineers, climbers and voyeurs to the Mer de Glace glacier, this hotel is steeped in alpine history and is remarkable with it’s panoramic mountain views. Accessible only by the famous rack and pinion Montenvers train, the oldest sightseeing attraction in Chamonix, it’s an adventure just to get to the hotel. The magic of staying at Terminal Neige Refuge du Montenvers, is that once the last train departs at 16.30 everyday, the mountain is yours. Soak up the solitude and listen to the silence as the sun dips behind the highest peaks in Europe. We cannot recommend highly enough a stay here, even for just one night. This is the ultimate stay for hikers, outdoor families, and those wishing to lose themselves (in comfort) in the mountains. Terminal Neige welcomes families and has a variety of room combinations to suit family groups. The Mer de Glace glacier is a spectacular sight snaking its way down the mountain. Sadly it’s greatly receding. Back in the seventeenth century the ice reached all the way down to the valley where it was feared by the locals. The Mer de Glace glacier, France’s longest at 7 kilometres, is an infamous tongue of ice snaking through the valley from behind Europe’s highest point, Mont Blanc. This glacier is definitely a jewel in France’s crown. If you’re travelling or planning to travel to France check this post – 13 hidden gems in France. From the hotel it’s just a couple of minutes walk to the Mer de Glace view point. The famous Chamonix ice caves can be accessed by gondolas (included in your train ticket) between 10.30 to 16.00. The hotel, formerly The Grand Hotel du Montenvers, opened in 1880, long before the railway was constructed. A mule track built in 1820 was used to gain access to the site and a first building was constructed in 1840, being rebuilt in 1879 with 60 beds and a restaurant. Over 200 mules would bring 12,000 visitors a year up to this magnificently isolated spot to see the incredible glacier up close. What an adventure it would have been to visit the hotel in those times. 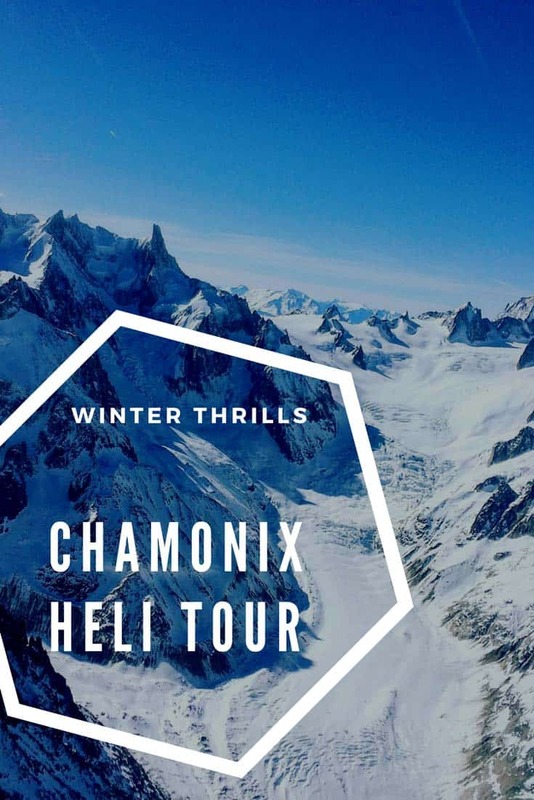 Visiting Chamonix? Don’t miss stepping into the Glass Box! Sympathetically renovated by the Maison Sibuet hotel brand, this historical building threw open its doors once again to guests in July 2017. 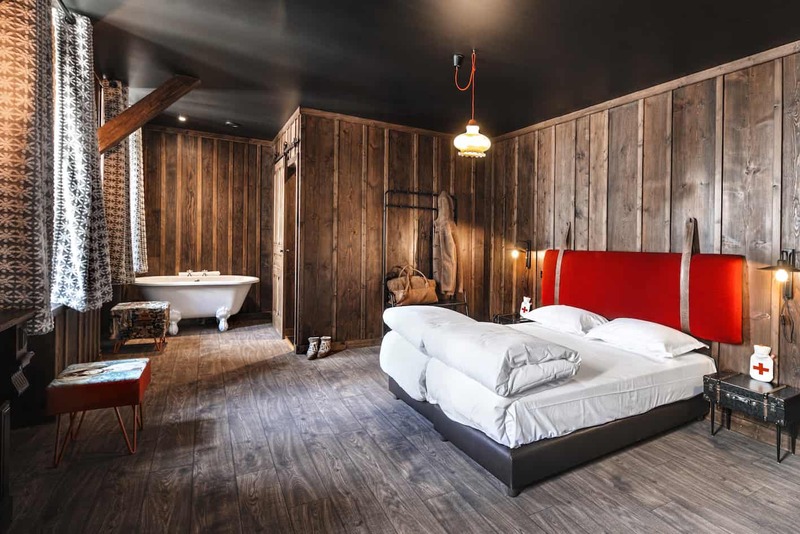 This unique mountain refuge hotel now offers cosy boutique accommodation on a half board basis. Rooms are simply furnished. Original wood panelling retain the building’s historical charm whilst modern fittings contrast sharply to create an cosy, stylish interior. We stayed in the Randoneur Famille room which can comfortably sleep 5. 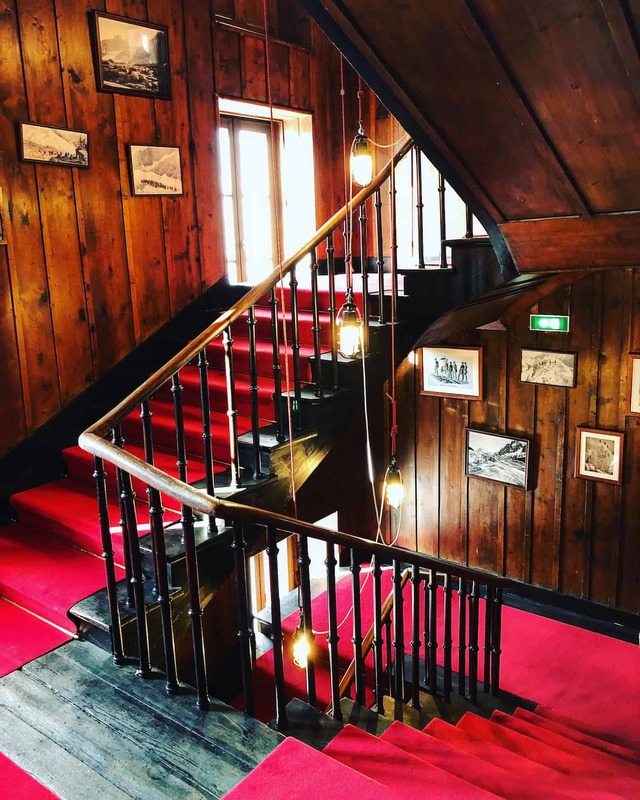 It’s original alpine spirit can be seen in small detailing such as the rope lighting on the staircase and faded black and white photos of the hotel and the glacier in days gone by. 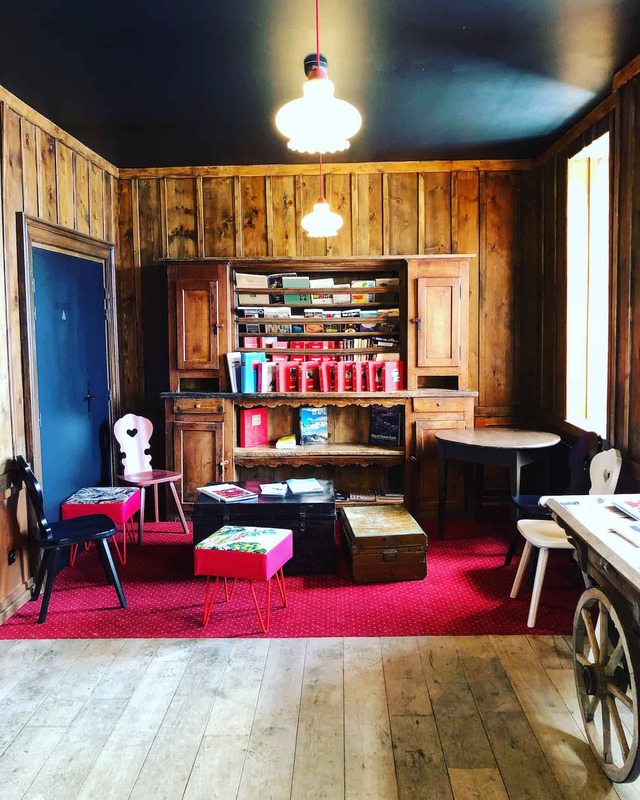 Escape into the library and inhale the musty interior of leather bound books on the golden age of alpinism or pore over maps of the area to plot your next hike, climb or alpine adventure. The ground floor is a huge integrated space housing the bar, the restaurant, a roaring fire with leather chairs and cosy cushions. Whilst the hotel is not geared specifically towards families, it has several family friendly rooms and my kids were welcome to play in the downstairs area by smiling staff. The snug next door is perfect for playing board games, reading a book or sharing a romantic bottle of wine. 20 rooms offer a variety of accommodation to suit all groups. 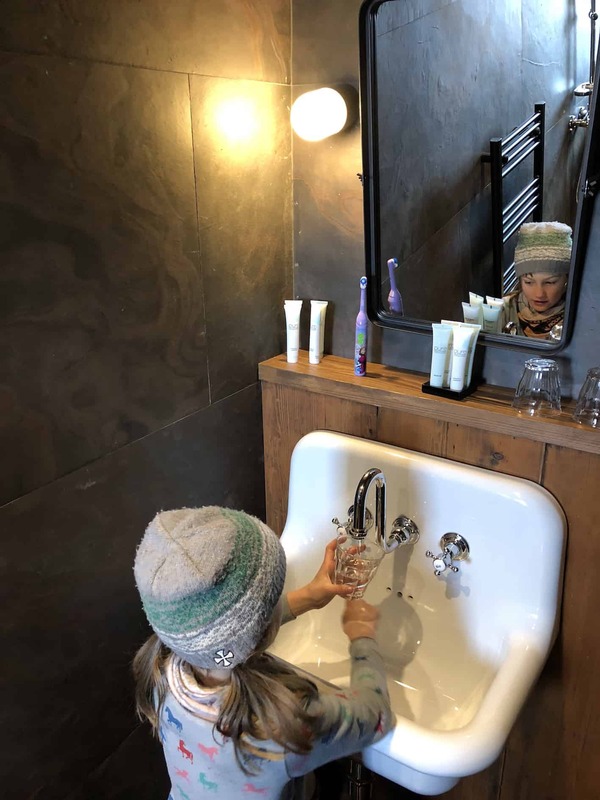 We stayed in the 5 bed randonneur famille room (from €305 for two) which is perfect for families with a double bed & a sofa bed in the main room with an adjoining bunk room. The refuge rooms (from €210 for two) are standard doubles, many giving outstanding views of the glacier (see below). I love the use of mountain wool fabrics and vibrant colour that pops from the muted colours & wood panelling. Springy carpet flooring imitate wood floorboards whilst old school radiators pump out plenty of heat into these heavenly rooms. Randonneur rooms (from €210 for two) can sleep up to 3 with a double and a sofa bed. All slate and chrome, the compact ensuites have been designed with style. The rainforest shower is luxurious, whilst the view, even from the shower, is jaw dropping. Old fashioned modern sinks complete the bathrooms whilst High Altitude bathroom products are offered to all guests. And thankfully being at such high altitude, the tap water is potable. Suites (from €360 for two) can sleep up to 3 people (1 double & 1 sofa bed) and come with the luxury of a roll top bath. 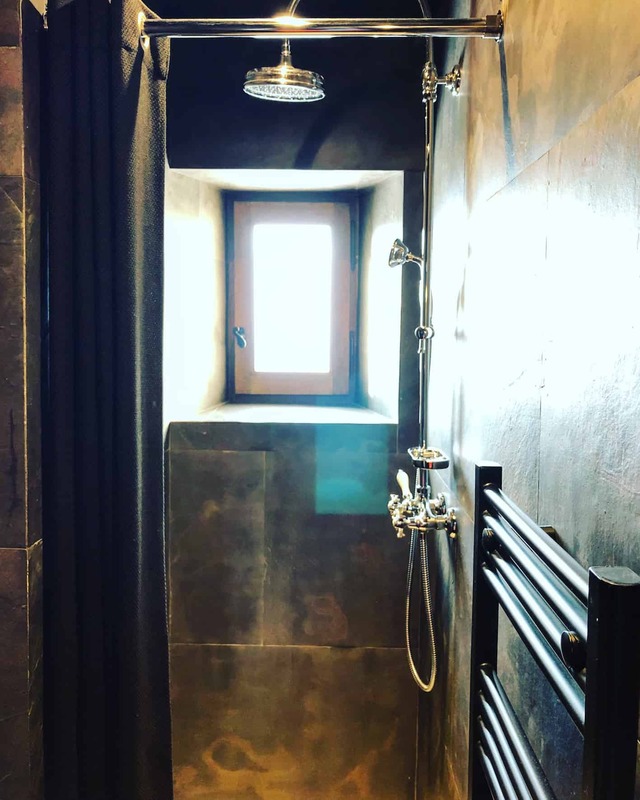 Up in the attic the brighter Tribu ensuite rooms can sleep either 5 or 7 people (€305 or €400 for two, extra people charged per person) so again perfect for families or groups of friends. 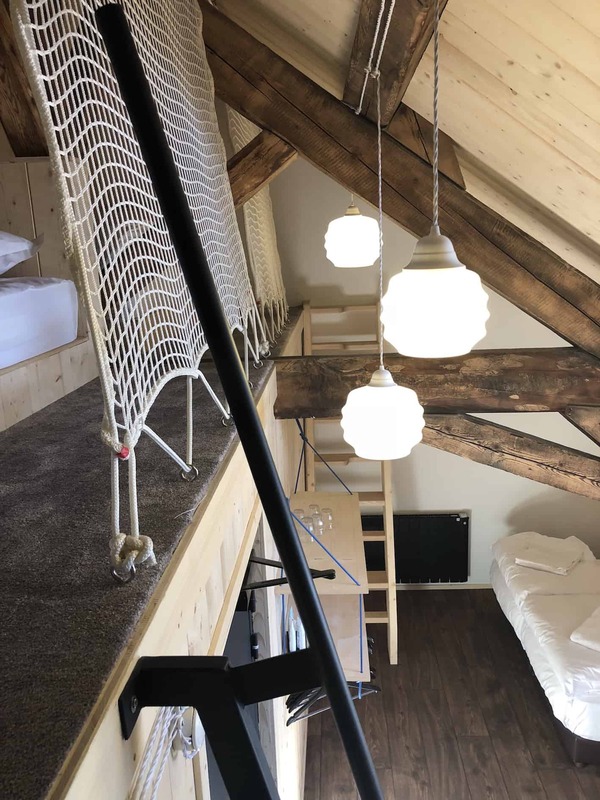 Kids will love to sleep high in the rafters. We love that Maison Sibuet has kept the soul of this iconic building by insisting on a 10 bed dormitory in the eaves. The original hotel housed intrepid travellers, famous writers and adventurous ladies only in dorms, there were no private rooms. Designed to be beautifully functional, the dormitory has thick wool curtains to give privacy to generous cocoon pods with deep luxurious mattresses. Prices from €85 per person per night (includes 3 course dinner without drinks and breakfast). 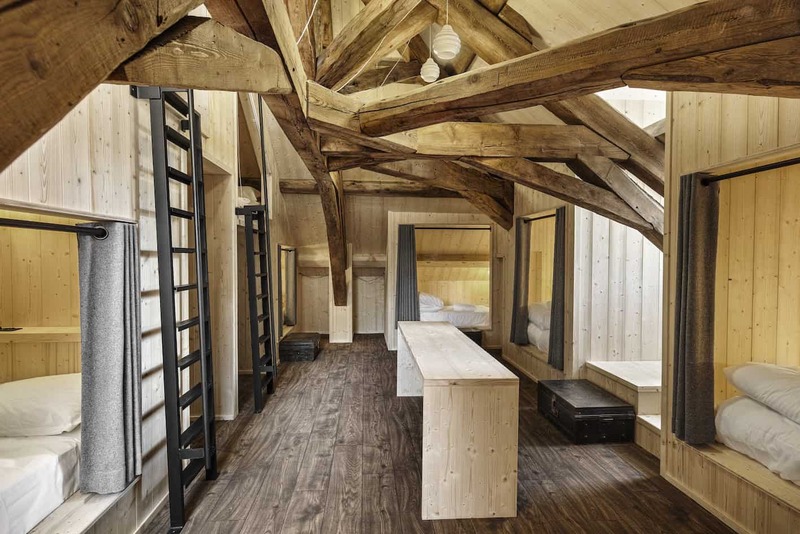 I’m already planning to do some serious summer hiking with some friends and booking this dormitory! Possibly the best dormitory in the world? If you want to see with your own eyes the amazing location of this refuge hotel, take a look at the hotel’s video clip below. As room rates include dinner and breakfast, guests can sit down to a 4 course dinner between 19.00 – 21.30. Mingle with other guests and talk mountains and snow or in Summer hikes and bikes. What’s sure is, you’re guaranteed to meet other interesting folk who have also lost their heart to les montagnes. 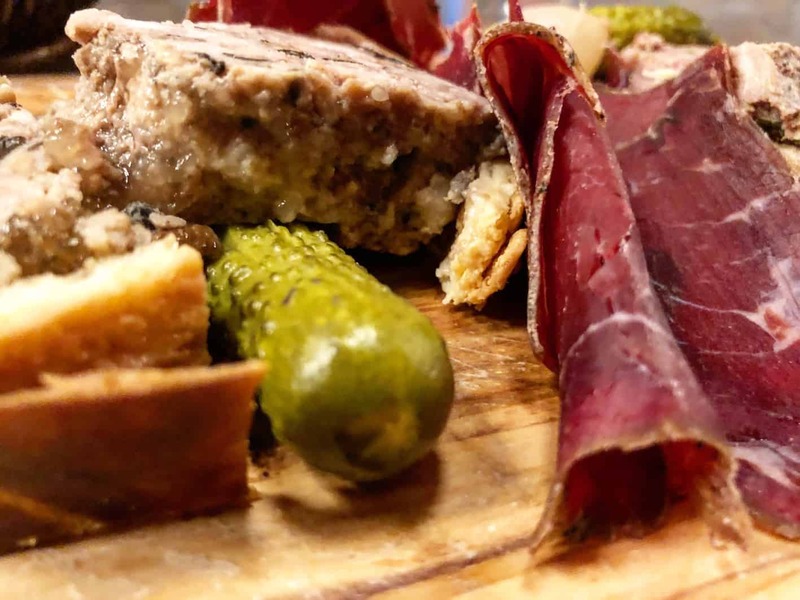 Wolfing down our first course, planche du charcuterie with a terrain de campagne maison, over the local Mont Blanc beer at the bar, we chatted to one of twelve friendly staff, Claire, who recounted dramatic stories of living and working in such extreme location. At the mercy of the elements, the hotel had in fact been forced to close for 20 days this Winter due to the incredible amounts of snowfall this season. 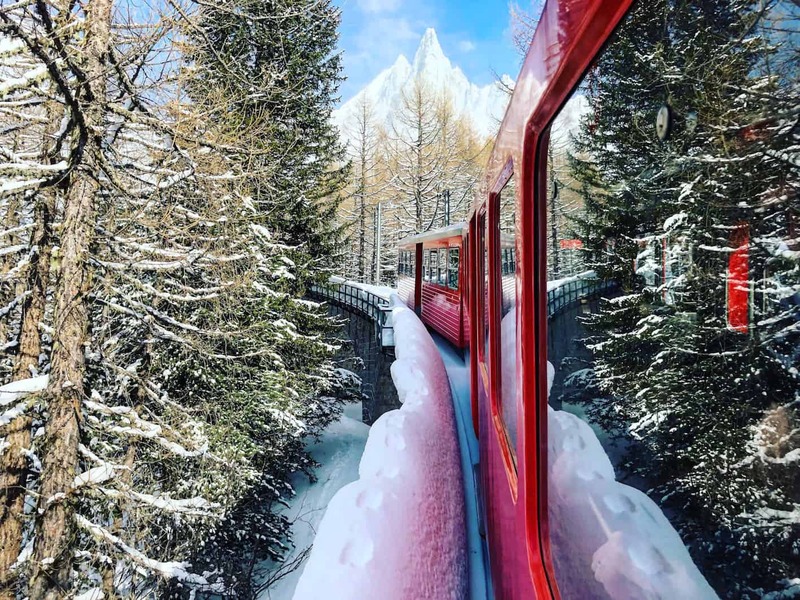 On one occasion it had been necessary for guests to stay an extra night, whilst the 6 kilometres of rail track was cleared of ice, so the train could make it up to the mountain. These stories we listened to with glee, and of course, secretly I hoped it would happen to us! Drinks aren’t included in the half price board and can on the pricey side at the bar (€10 a pint). We made sure we paid cash each round to make sure we didn’t rack up an eye watering bill (easily done in such a relaxing environment). The house red though, is excellent and reasonably priced at €28 a bottle. Second course was a delicious french onion soup, accompanied with a green salad with walnut and beaufort cheese. My 7 year old devoured it to our surprise and has repeatedly been asking for it at home since. Mains next. 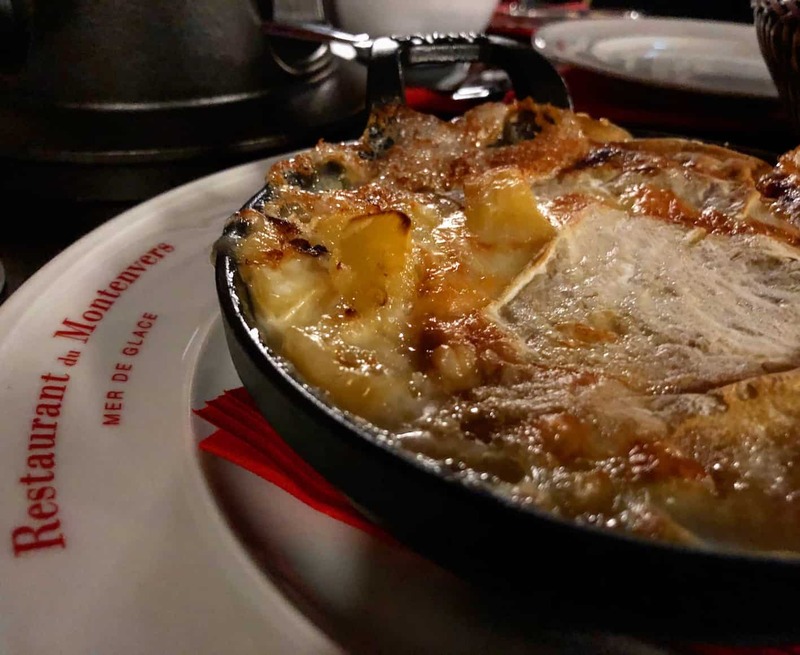 We had five to choose from, most of them famous cheese based Savoydarde dishes – pure mountain food. Tartiflette (bacon, potatoes, cream and cheese), Ecorce de sapin (hot ecorce de sapin cheese bubbling in it’s round wooden box accompanied by cured ham, steamed potatoes and a green salad), Fondue (beaufort, gruyere and compté cheese), Diots de Savoie (local sausage with polenta) or Volaille fermiere a la broche (chicken leg in a jus with fondant potatoes). The kids menu is steak haché with mash/french fries, pollock fish with green beans or pasta with ham, with an ice cream dessert. 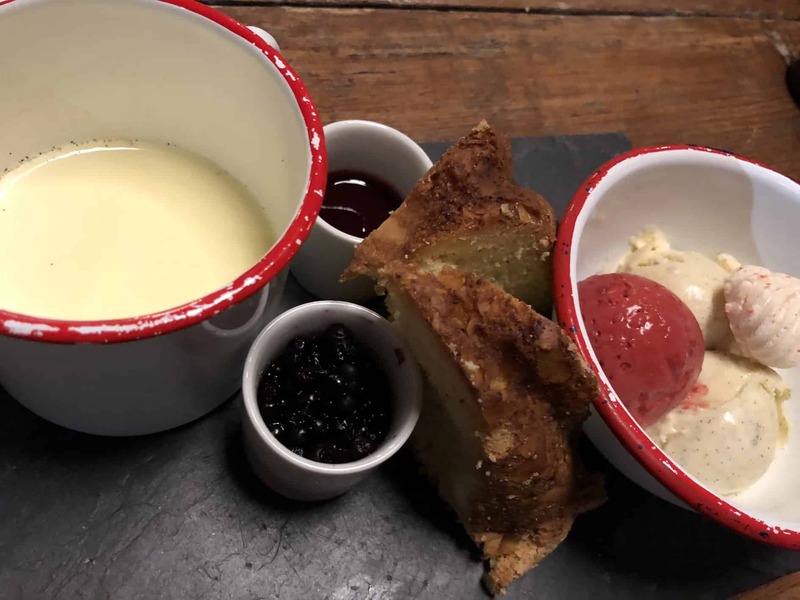 Dessert for grown ups was a feast – a slate platter of ice cream and sorbets with fromage blanc and fresh blueberries. Err what’s not to love here? An amazing platter of panacotta, fresh blueberries, cake and ice cream. Yum yum and more yum. – Check out is at 11.00. The hotel does have a luggage room for you to store your bags during the day. – The first train down to the valley leaves at 10.30am. NOTE: The booking system on the Terminal Neige website only states ‘adults’ which can be confusing when booking for a family. In actual fact, there is no difference between adults and children with regards to price so when booking put in the number of people in the group, as the price is per bed. To get a quote or to book go to Terminal Neige or call 00 33 (0) 4 57 74 74 74. The hotel is perfectly situated to take advantage of outdoor activities. Many visitors just admire the astonishing glacier views, and relax, drinking in the fantastic location. 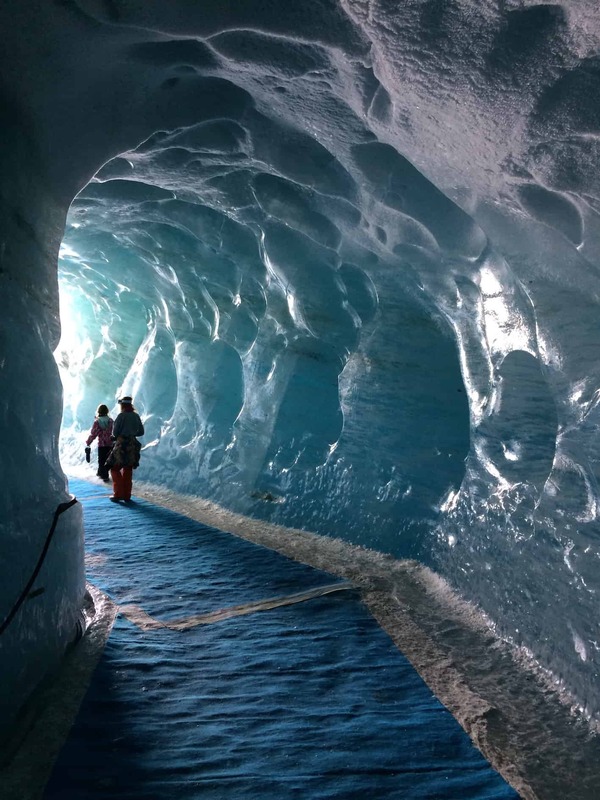 Kids will love checking out the ice caves drilled into the glacier. Gondolas take you down to the nearest point of the glacier, to the beginning of a series of steel steps that zig zag down to the ice caves. There are over 400 steps down so unfortunately anyone with mobility issues would not be able to descend. It doesn’t take too long to get down though – last time we timed it – 13 minutes to get down and 15 to get back up – not bad! Read more about our visit to the ice caves here. 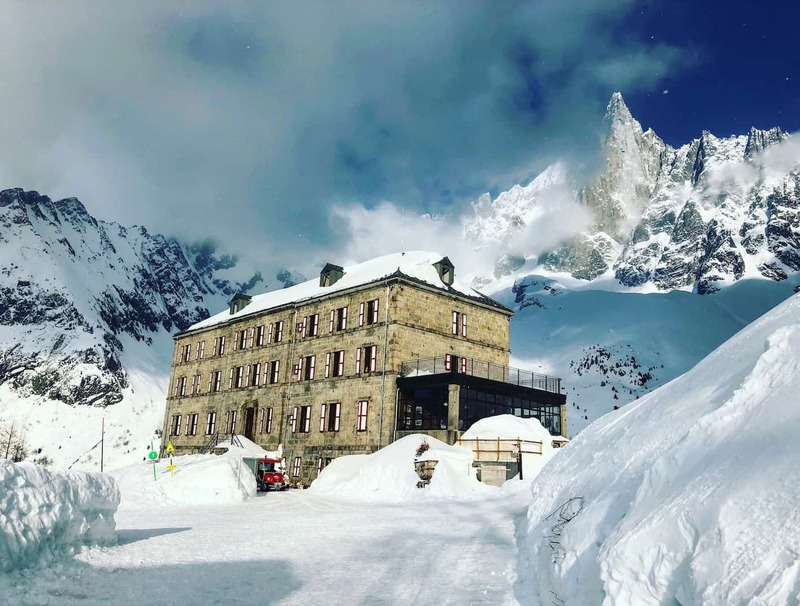 If you’re planning on skiing the Vallée Blanche, the longest off piste run in the world, 20km in total from the Aiguille du Midi to the end of the Mer de Glace, then booking an overnight stay at Terminal Neige would be the icing on the cake. For more information have a look on www.vallee-blanche.org or contact the Compagnie des Guides. In Summer, hiking in Chamonix is truly fantastic. The valley offers a huge variety of hiking trails from valley floor to high altitude. One such high altitude hike is a 3 hour walk from the Mer de Glace over to the Plan d’Aiguille (Aiguille du Midi mid-station) or reverse. It’s also possible to hike up to the hotel in Summer taking the path from Les Planards (3-4 hours), stay in the hotel overnight and then take the train down (or reverse). I am planning some seriously long hikes this Summer and will definitely work in a stay at Terminal Neige at the end of one of them. Access to the hotel is generally for most, only by train. Keen hikers walk the 3 hour trail up from the valley floor in Summer, or good skiers can ski down via the Vallée Blanche in Winter. For most though, you’ll be catching the train. 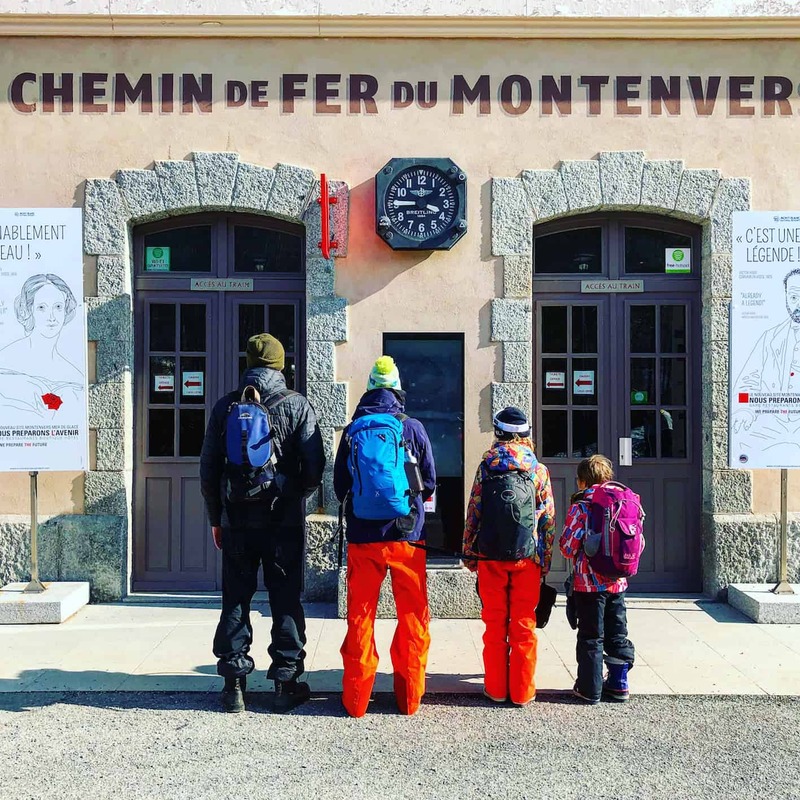 Don your backpack and head to the Gare du Montenvers to take Chamonix’s glacier train, the Montenvers. The Montenvers train station is not at the main train station in Chamonix but very close. Head over the steel pedestrian bridge on the left of the main train station to reach the Montenvers departure point. The Montenvers train ticket up to the hotel is not included in the hotel price. You will receive a confirmation email after booking from Terminal Neige with a link to book your train ticket. The last train up to the hotel leaves at 4pm and if you miss it there is no other way up to the hotel. Be prepared and get there early! TOP TIP – get the 13.30 Montenvers train up and head straight to the Glaciorium for 14.00 to grab a pair of snowshoes they give out daily at this time. Select one of the easy snowshoeing trails to walk before checking into the hotel at 16.00. €32.50 adult return / €27.60 child return / under 5’s free / family pass €100.70 (2 adults or grandparents + 2 children – 3rd/4th/5th children go free. Check here for more information on times and tariffs. It’s pretty pricey to go the Montenvers, especially for a family. If you’re skiing in Winter I would recommend getting the Mont Blanc Unlimited Pass for the day/days you want to stay at the hotel as this pass allows free access up the the Montenvers Train (as well as the Aiguille du Midi & Tramway du Mont Blanc). If you book the Unlimited pass online 3 days in advance you can get 20% off the pass price. The nearest airport to Chamonix is Geneva which is a 1 hour drive away. Cheap flights can be found with Easyjet who flies from the UK and from other European destinations. From Geneva rent a car from the airport or book a transfer via Chamonix Valley Transfers, Mountain Dropoffs or one of the many other transfer companies servicing the Chamonix Valley. Expect to pay around €35 one way. Travelling by train to Chamonix is not the easiest option, as there is no direct train. Expect to change a fair few times. The Eurostar from Paris goes as far as Lyon. From there pick up one of the regional SNCF trains to St Gervais where you need to change onto the Mont Blanc Express train that will stop at Chamonix. Terminal Neige or call 00 33 (0) 4 57 74 74 74. Disclosure: we received a complimentary over night stay at Terminal Neige for the purposes of this review, however all opinions are, as always, our own. This post also contains affiliate links. Should you click on a link to purchase, it is at no extra cost to you, but I get a small commission that goes towards the running of this blog. Wow, what a beautiful region of France and so stunning. 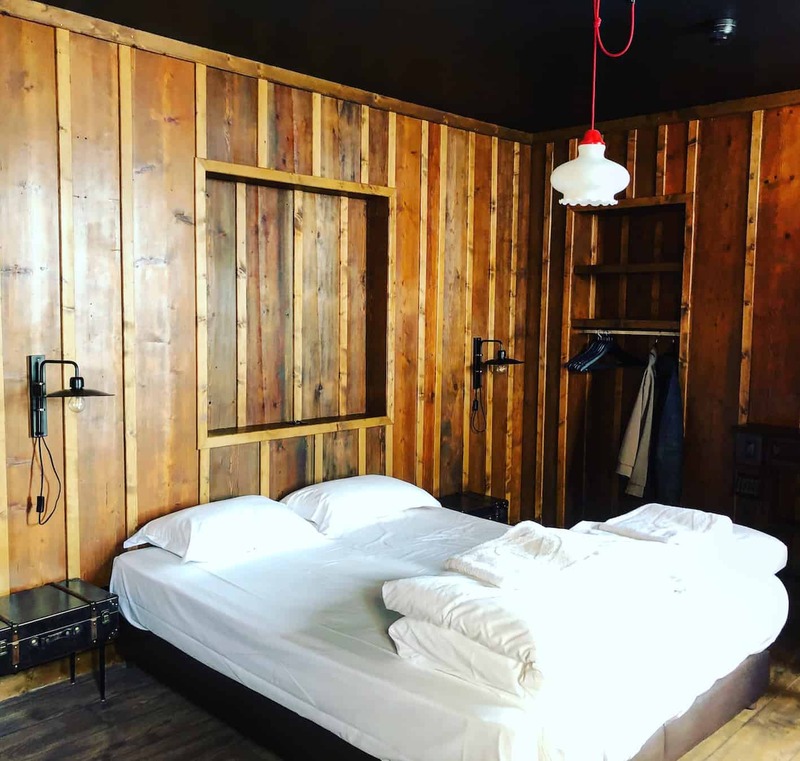 I absolutely love the rustic and organic/modern focus and details of this boutique inn, I would absolutely stay in this type of place if I visit the area. Love love love the look of this place, thank you so much for sharing it, it’s now on my wishlist. The historical building and interior decor are gorgeous and I love the setting. Those dorms are just gorgeous! I thought they might look shabby compared to the rest of the hotel but they’re so lovely and charming – a million miles away from a typical hostel dorm experience. What a charming hotel indeed! It looks and sounds like a wonderful place to stay, with everything I would need in an accommodation. The approach by train looks almost like it’s out of a fantasy! I’d love to visit Chamonix in winter or summer. I can see why you would recommend Terminal Neige! What an incredible experience to stay on a glacier! It is such a storybook picture, imagining a ride on that red train and to be stranded in this old refuge that feels cozy yet mysterious at the same time. The food! Oh the food! Great way to spend a holiday and get that Mont Blanc Unlimited Pass to ski as well. Great post – your photos are stunning! Amazing photos! The Mer de Glace glacier is breathtaking! I almost cried when I saw the title and read this post. We just got back from a long trip that included Geneva. We REALLY wanted to visit Chamonix but just ran out of time. Now I am even more sorry that we missed this. The rack and pinion train was definitely on our plan to see. Maybe we need to visit in the winter! Though we have visited the Swiss Alps, we never made it to the French Alps. We would love to visit Chamonix. It looks the perfect white wonderland. Terminal Neige, Refuge du Montenvers looks like the perfect place to stay. I like the fact that it can only be accessed by train. Loved the wooden interiors of the hotel. It blends so naturally and harmoniously with the surrounding environment. 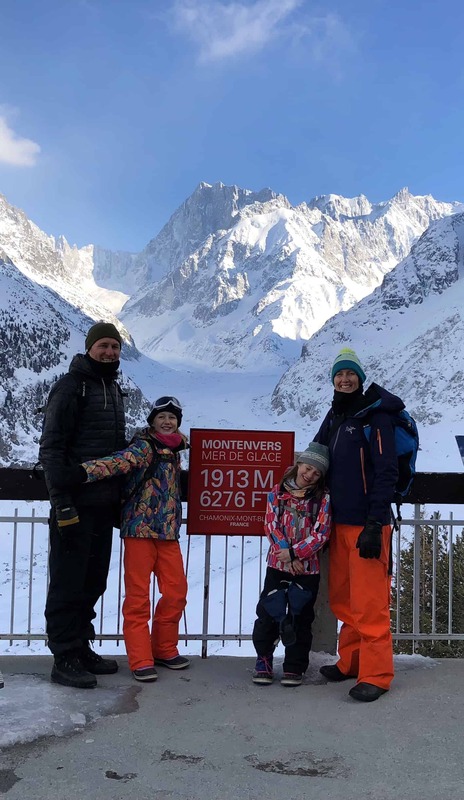 Chamonix Mont Blanc is way too extreme for our family ski holiday? Right? No WRONG! Chamonix has loads of beginner slopes and brilliant greens and blues for kids to rip down. The valley has 5 ski mountains to choose from plus it offers plenty of intermediate and advanced terrain for other family members who are looking for adventure. What we love about Chamonix is – it’s a real town, rather than just a ski resort. The town is steeped in alpinism history with breath taking views wherever you look. 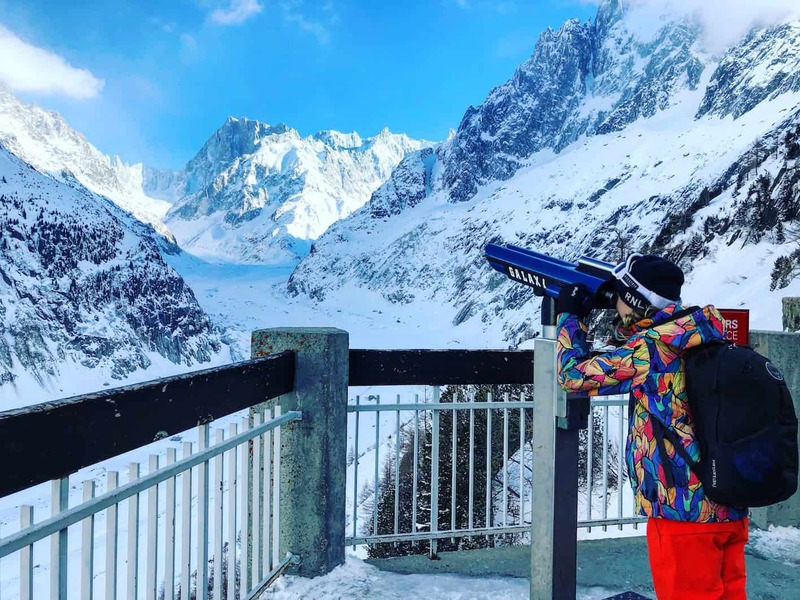 Have a look at our posts to get a gist of what you can get up to with kids in Chamonix and feel free to shoot us a question in the comments for any advice on visiting. 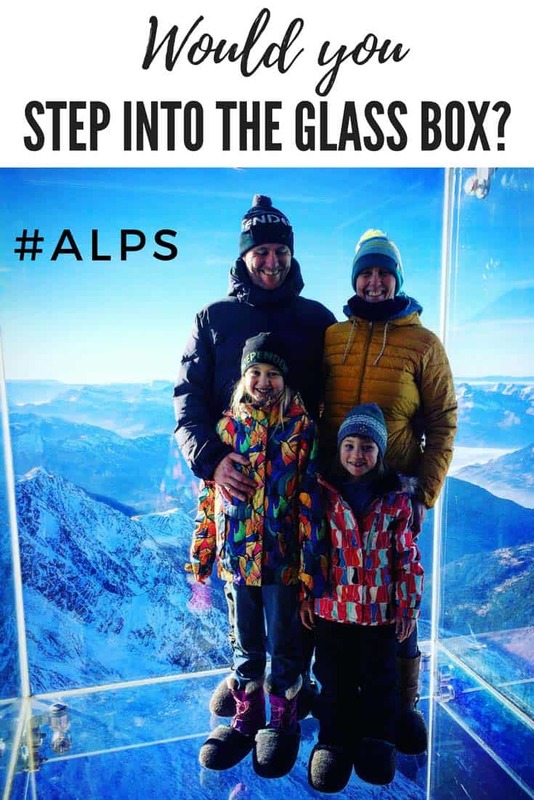 Have you visited the Mont Blanc glass box?